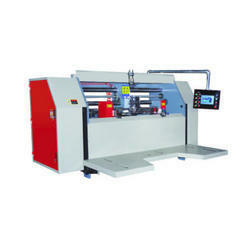 Prominent & Leading Manufacturer from Navi Mumbai, we offer semi automatic stitching machine. We are leading supplier of Semi-Automatic Stitching Machine. All bearing use the domestic well-known brands unless seat belt bearing. The whole group of Stud used in Japanese imported mold steel to make, CNC precision machining. Nailhead blade and bed die to use the German tungsten steel production (Abrasion). Looking for Stitching Machineries ?